It was a gorgeous autumn day yesterday and since we were in Neepawa, one of Manitoba’s prettiest towns, where I’d be doing a reading later in the Margaret Laurence house, and since we’d finished our chicken and coleslaw and chips at the Chicken Corral and I’d changed out of my driving clothes into my reading ones in the restaurant bathroom and we still had an hour to spare, H. and I decided to find the cemetery. Riverside Cemetery is where Laurence, the famous Canadian writer, is buried, and where, we’d been told, the stone angel stands, who gave title to her book, The Stone Angel, with its memorable protagonist Hagar Shipley. The friendly waitress at the Chicken Corral, who gave us directions to the cemetery, said we couldn’t miss it. Well, we missed it. In a manner of speaking. We drove by it at least four times and saw it and didn’t know it, because she’s not really an angel, but a shepherdess with flowers, a cross, and a sheep, and she has eyes, though lidded and lowered. And she’s not on the brow of the hill exactly, is smaller than I’d imagined, and not at the gravestone of a woman but upon that of the Hon. John Andrew Davidson. Unable to find the angel, we’d inquired of a woman walking her dog who pointed us clearly in the direction of the shepherdess. Once again, looking for wings, we missed — or dismissed — it. Some while later, wondering by now whether we were as blind as the stone angel had been, we encountered another woman in the cemetery who immediately offered to lead us to the angel. And there she was, right where she’d been all this time — the shepherdess! 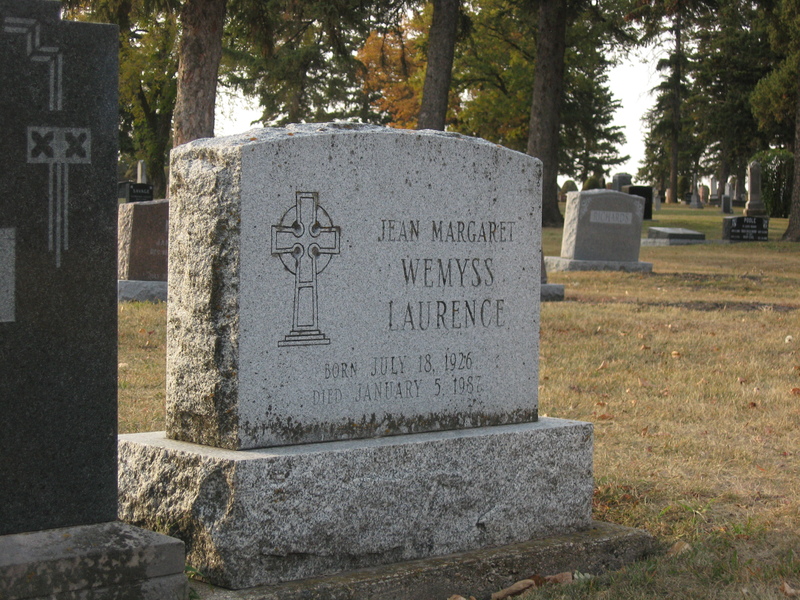 We adjusted our thinking, took some photos, and then followed the woman further, because she was eager to show us Margaret Laurence’s grave as well. How appropriate, I thought, in my freshly adjusted thinking about everything, that it’s her memorial stone (next to the more imposing family Wemyss stone) that looks over the valley and town. And if it was a tiny thrill to stand at Dostoyevsky’s grave in St. Petersburg earlier this summer, I have to say it was no less a thrill to stand at Laurence’s. 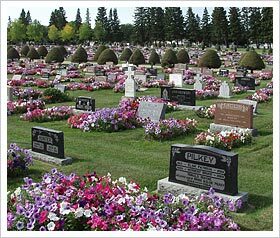 The cemetery is very attractive, and apparently even more beautiful in summer, when it’s filled with petunias. They’d just been removed for the winter, the woman told us. But even in summer, she informed us further, there were none at Laurence’s grave. “She hated flowers!” she declared. Our guide insisted on leading us to the small memorial stone for three Titanic victims as well. (Everyone we met in Neepawa was so friendly, and the audience we enjoyed later at The House lovely and attentive.) After she’d gone on, we wandered back to the “angel” for another contemplation. A man who’d been taking pictures at the site at the same time we were, now returned as well and we engaged in some (friendly, of course) conversation. He was a local resident, wanting to capture the particular beauty of the day with its September light. Since he’d overheard us say we were from Winnipeg, he asked what we were doing in Neepawa and I said I was a writer come to do a reading. “Yes,” he said immediately, “you look like a writer.” I thought that delightful, and laughed, though I have no idea what he meant by it. But back to the angel who wasn’t an angel but a shepherdess with a sheep. This delighted me too. It was perfect, really. Laurence was a fiction writer after all, and if this inspired her, she grabbed it and used it and transformed it. She made it what she needed it to be. Neepawa wasn’t quite Manawaka either, in spite of all the ways the writer might have drawn from it. It reminded me of what writer Richard Ford said the other evening, during a conversation with host Charlene Diehl and writer David Bergen at one of the Thin Air mainstage events. The question was raised about personal parallels to their newest books (Canada and The Age of Hope). There are few, both answered. Ford said further he resists the question he often gets about autobiographical elements in his work; he said it seems to imply the writer’s imagination isn’t big enough to move beyond the self. In the cemetery in Manawaka, on the other hand, there’s a large stone angel with unseeing eyes and and snow-and-grit pitted wings. In Manawaka, the flowers are peonies. 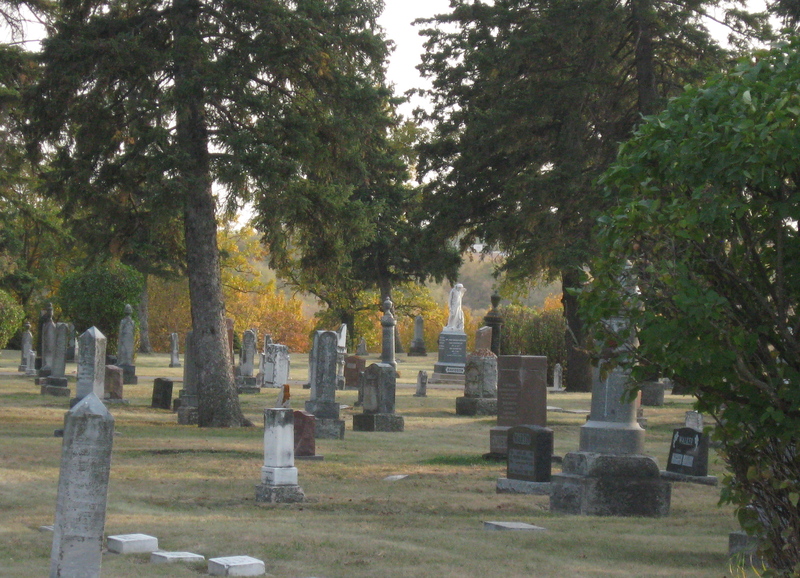 The shepherdess at a distance, Riverside Cemetery, Neepawa. This entry was posted in Writing and tagged Neepawa, The Margaret Laurence House, The Stone Angel by doradueck. Bookmark the permalink. Thanks for showing us how the “real” angel differs from the imagined one. One more occasion to think about memoir and fiction and memory. A lot of memoir memories are probably no more “accurate” than Laurence’s imagined angel. Thank you for that lovely post. I must visit Neepawa on another trip to Manitoba. I am a fan of Margaret Laurence for sure and it sounds like a delightful place to visit. Somehow, we onl;y seem to get south of the Trans Canada highway when we are in Manitoba…must have something to do with where relatives and friends live:) I have ordered your book and am looking forward to it. I know what you mean about the TransCanada! You’ll have to take the #16; it goes through it. — One of these years I want to re-read some of ML’s books. Thanks for the memories. We have often visited the cemetery in summer for the flowers and the history. Hey John, great to hear from you! We just got back from our Poland and Ukraine tour and know all about cemeteries; how we thought things should look but they don’t! Will blog about it when I’ve wiped the jet lag from my eyes! Welcome back! Looking forward to hearing more. How did your reading go last night? Sorry I couldn’t make it. I had two other commitments that night. Sounds like such a wonderful autumn afternoon! 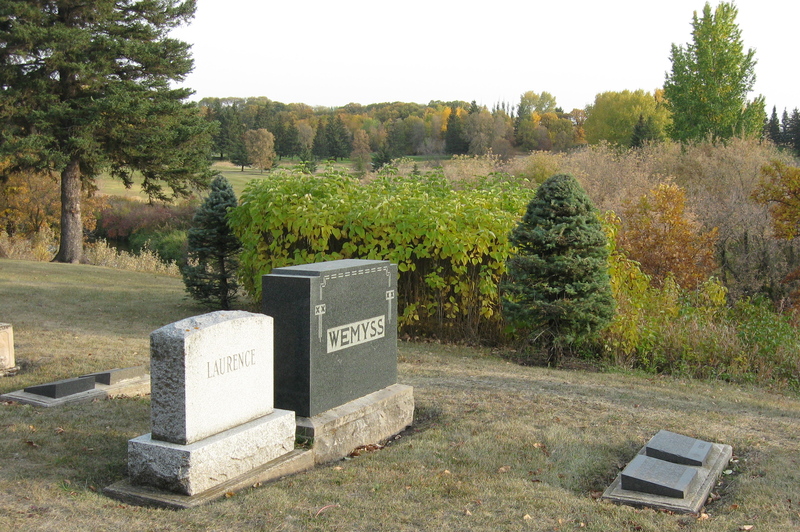 I’ve been to that cemetery … I took a bunch of teens when I worked in Brandon with Katimavik. One of them found it inspiring, I think. Hope your reading went great, Dora! Sorry to have missed that. Thanks so much; it was a wonderful autumn afternoon indeed. When it soon after turned so wintery here, it was almost hard to believe! We were traveling through Neepawa and used your post as our guide. Without it we would never have been successful in our search. Thanks for writing!